Feedback: 35 comments - leave yours! 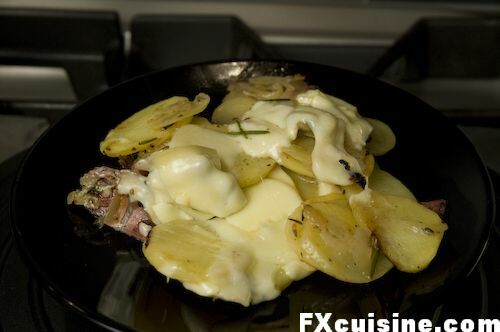 This is not a traditional recipe and is not roesti. I made a simple Alpine dish with what I had in my kitchen and it came out so nice that I remade it the next day to show you. 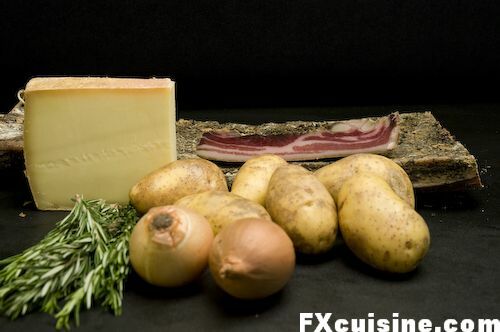 Please consider this as an unpretentious illustration of what you can do with food specialties you can bring back from a trip to the Alps - dried bacon, herbs and cheese. Every conscientious and well-informed foodie should bring some fromage d'alpage cheese from Switzerland. These are the cheeses made in small chalets up there in the Alps where there are no roads, no electricity and no running water. These cheeses are made from the unpasteurized milk produced by cows during the spring and summer while pasturing on high-altitude meadows. The rich diversity of their herbal diet - a selection of the finest flowers, herbs and grasses that grow in the Alps - make for a uniquely rich tasting cheese. There is no rousseauian snobbery here, any blind test will show you that these cheeses just taste better. 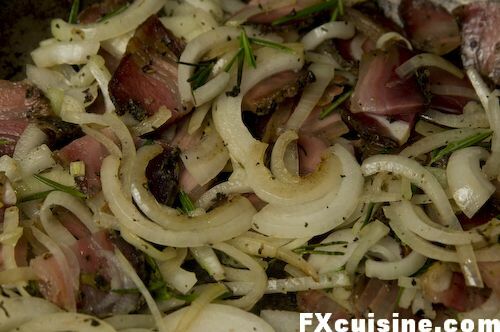 You can also leave out the bacon and rosemary for a simpler dish. Quantities are approximate as always for a peasant recipe. 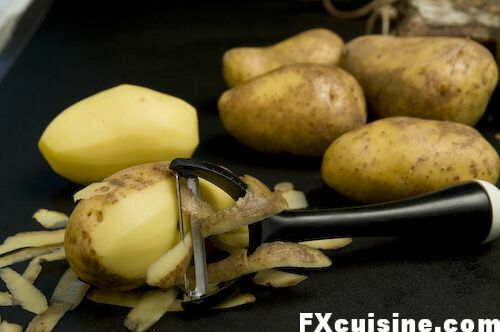 Start by peeling the potatoes. 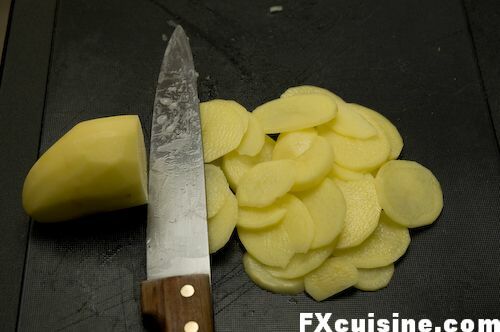 Then slice the potatoes as thin as you can. 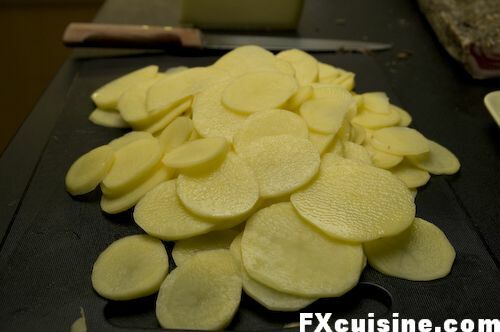 Continue until all the potatoes are sliced. Discard the peel. 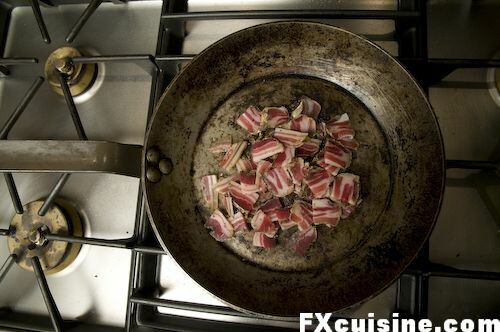 Place the bacon in a large iron pan (photo) and start on medium high heat. 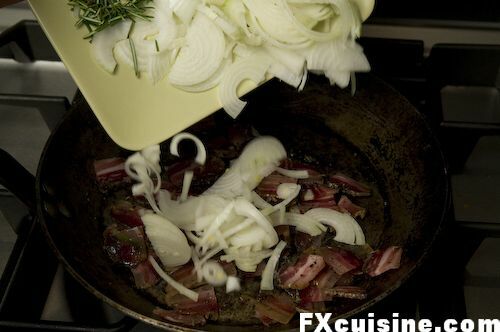 When the bacon starts to soften and render some of its fat, add the onions. You may have to add a little oil! 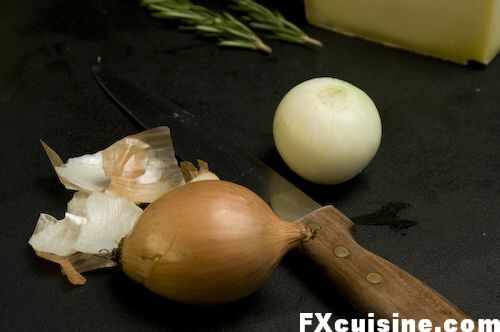 Mix, add the rosemary and stir until the onion starts to soften. ... and mix them in. 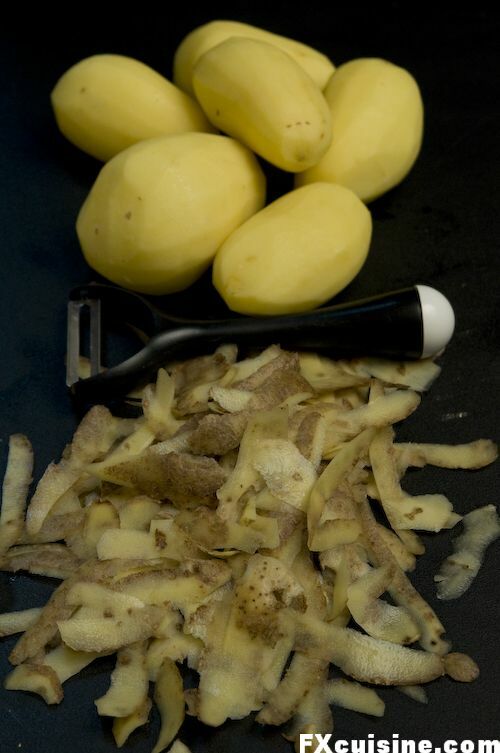 Turn regularly until potatoes are done. 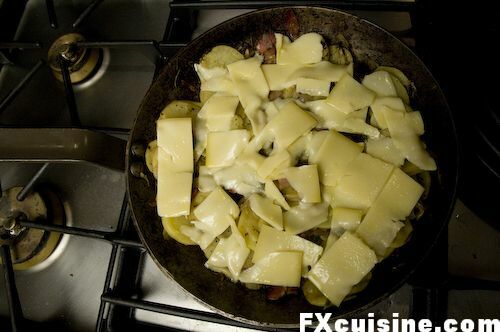 Meanwhile, remove the cheese crust from the part you will use. Slice as thin as you can. 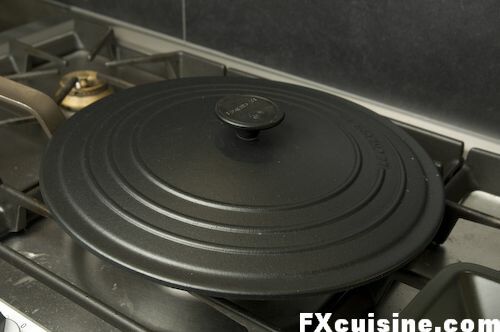 You may have to cover the pan and reduce the heat to ensure the potatoes are cooked through. 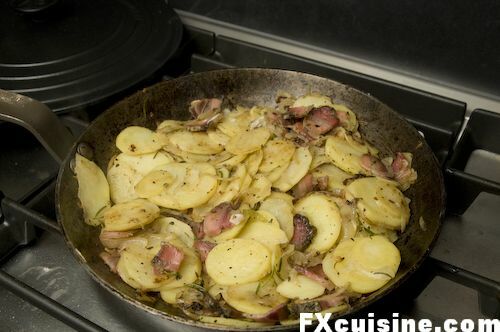 At last, after 20 minutes our potatoes are done and nicely browned. 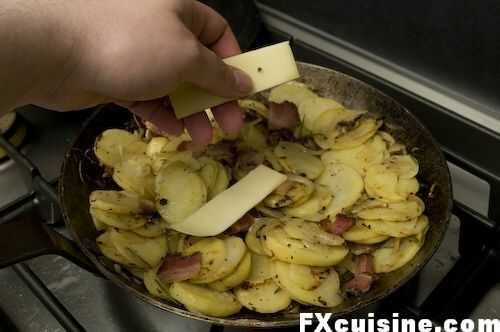 and cover the potatoes like tiles. There is only one way to melt cheese: slowly. 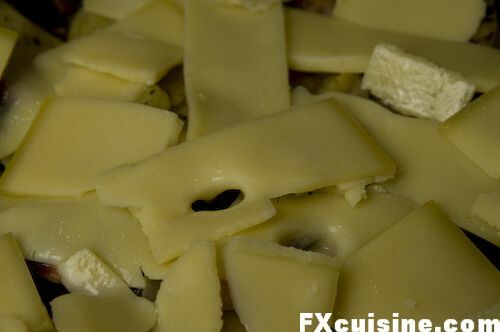 If the temperature is too high, the cheese will split and render oil and you'll have destroyed a mighty fine product. 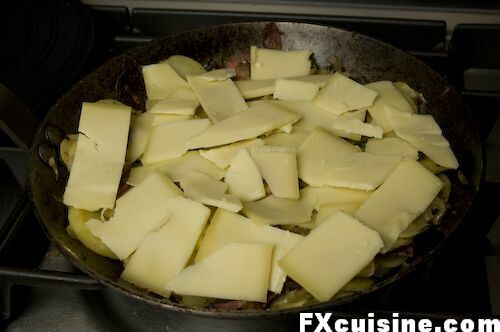 Just reduce the flame on low and cover again to let the cheese melt at its own pace. Peek as many times as you like to see how the melting progresses. Serve as a hearty winter one-pot-meal. 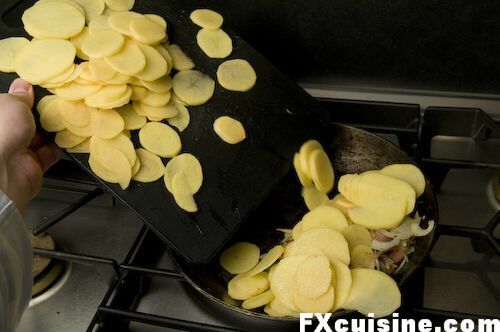 Please note that these are NOT roesti, a popular Swiss dish where the potatoes are cooked, left to cool down, coarsely grated and cooked in the same type of pan on a very low flame without any movement. 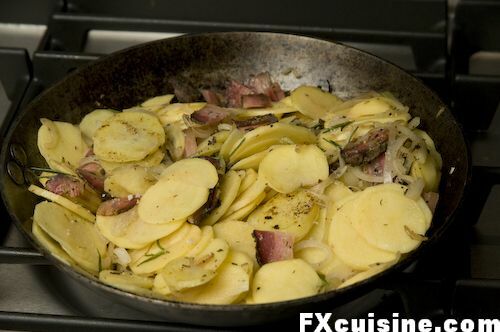 This IS a wonderful and rustic potato dish. It's too easy to ignore and not try. 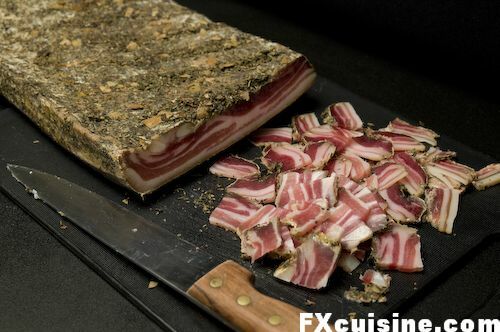 Simple but all about having the perfect ingredients... That dried bacon looks beautiful. Put a poached egg on that - quickly! Jason, thanks for visiting and I hope you get to taste some Swiss 'alpage' cheese soon! Peter thanks for visiting and trying out my Swiss dish! Definitely a dish worthy of Canadian trappers' food. Claudia, the poached egg sounds like a great idea! 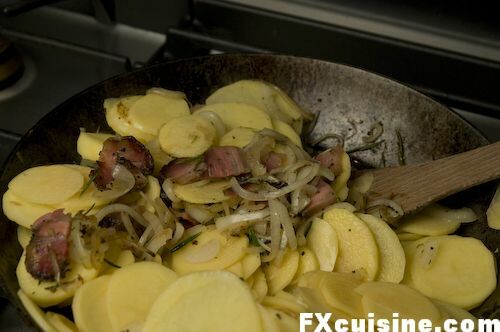 The more traditional way (certainly not the tastier way) here would be to just break the egg right on the potatoes and let it coagulate slowly. A calorie kick for the starved mountaineer! Traci thanks a lot for your kind comments on my blog! I hope it will inspire you to make some of these recipes down there in Orange County where the sun never sets! 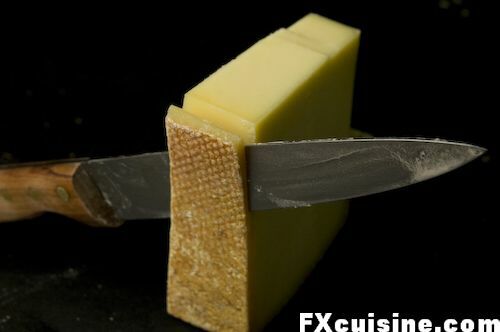 "I hope you get to taste some Swiss 'alpage' cheese soon! "So do I! Looks like I'll have to plan a trip for Switzerland. Unfortunately, that is black market cheese in the US, being an unpasteurized product. I'll have to bring plenty of socks and beanie caps for my cheese smuggling operation. Simple yet delicious. It's the bacon that makes it though - I don't think I can get bacon like that here in Sweden. Maybe I'll try it with pancetta. I just made this with Luter's Smithfield bacon and it was great, although a bit salty. I will simmer the bacon first the next time I make this. Thanks for sharing this recipe with us. Looks so delicious. Just found your site too - I love the step-by-step pictorial instructions with your recipes. And the recipes are nice too - I'll have to try this one soon. Thanks! Many countries ban unpasteurized cheeses, what a pity. 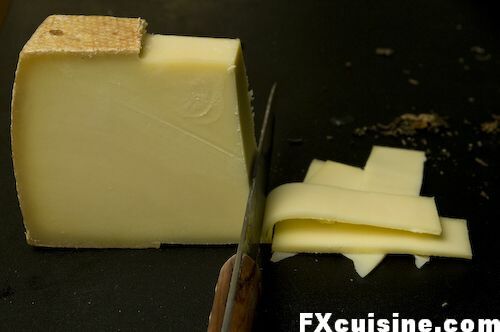 But contraband cheese sounds very tempting - the forbidden cheese of Switzerland! 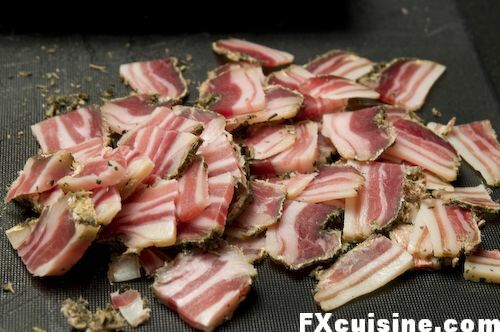 Saxit, perhaps you might try with guanciale rather than pancetta. 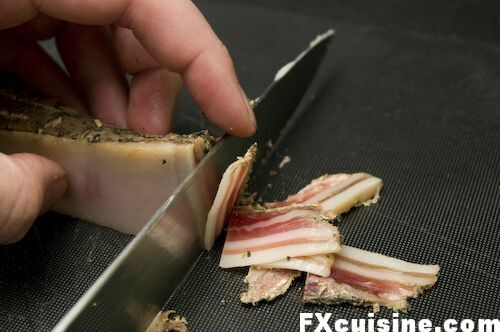 I would be surprised if Swedish farmers have never tried to dry bacon slabs with some spices. Are you sure you don't have a native Swedish bacon similar to ours? Vincent, soaking or simmering the bacon for a couple minute is definitely the way to get rid of excess salt. Just like the Portuguese desalt their dried cod, it takes just a few minutes. Thanks for visiting and trying this! Hélène thanks for visiting from Vancouver! Have a look at my gluten-free recipes filed under Buckwheat for some more ideas! Gina thanks a lot for visiting and I hope you get to try one of my dishes! It really looks very tasty:). Yummy! Thanks for your visit Roman! Beatrice, thanks for your kind words! I've never visited Süd Tirol but have some books about the food of Trentino Alto Adige. It is so similar to that of my native Swiss canton, Valais. But speck is definitely a delicacy best enjoyed with restraint! 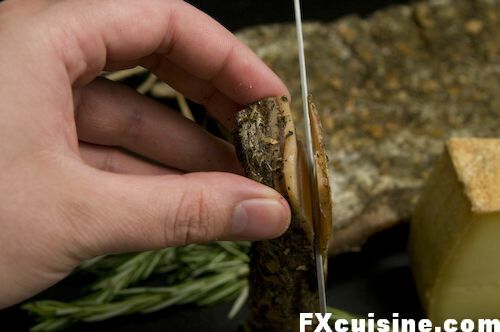 Hi, fxcuisine, fantastic food, and great pictures to show how. Not for the "fooddogooders" who are scared of natural ingredients, like Milk,butter and cheese. Titania, thanks for visiting and keep up the good work with the garden! I am trying to grow a camelia sinensis in a wardian case in my kitchen with a very discreet success so far! Oh, wow, fx, that looks like the speck we always try to bring home from the butcher shop on Kuttelgasse in Zurich... (droool) Spectacular! I should check our cheese place in Dublin and see if they've started carrying any Swiss bergkaese. Thanks so much for posting that! EuroCuisineLady, I think you could to this using some of the many fine native Irish ingredients. Don't you have traditional Irish dried bacon? I've had this a couple of times in York Market when we had European farmers market that travels the country. Fabulous. I was only thinking of it again the other day. What serendipity, then, that you published this. Great hearty food for cold days! Richard, stock up on the Speck next time you see some and you'll be set up to cook this all winter long! It looks to me like a very wholesome and hearty dish. I just recently came across your site. Everything looks delicious! Michael, indeed it is a conforting dish provided you get ingredients. 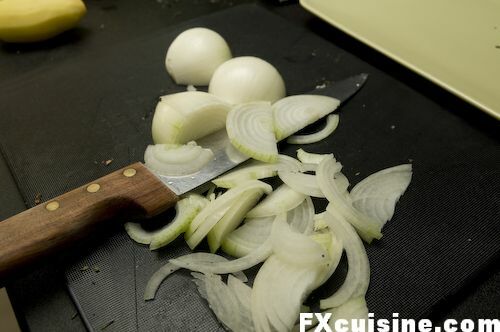 I hope you'll have time to check some of my other recipes and perhaps, try one! Thank you for the invitation. One of these days, I shall try your ragu finto.